That space under your bed is useful for more than just collecting dust bunnies. 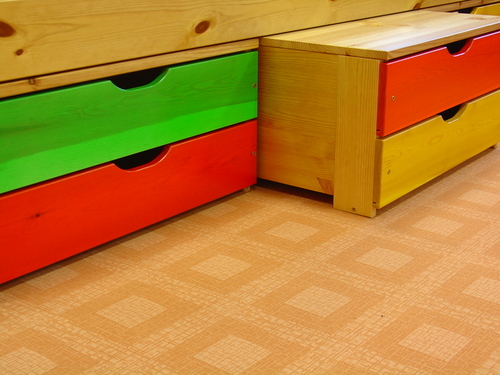 If you have a bedframe you love, you can purchase under-bed boxes for shoes or out-of-season clothing. Or, you can invest in a storage bed or (sometimes called Captain’s beds or platform storage beds). Once hard to find, you’ll readily locate thee beds in furniture showrooms. They come in a variety of configurations with drawers along the sides, or at the ends. Some beds take a page out of the recreational vehicle book and have lift-up hinges to provide for much larger storage of quilts, pillows and even vacuum cleaners. Similar to a bathroom medicine cabinet, look for shallow shelving with a “false front” that looks like artwork. Or, make your own by repurposing old mirrored cabinets by replacing the mirror with your favorite art. Use a bigger drawer (perhaps one of those under-bed ones, or create your own) trunk or a toy chest to hide that laundry basket. Tired of all the boxes and wires it takes to keep you connected? Grab some pretty file or photo boxes to stash them in. Just cut holes in the back for the wires to slip through. (Note: this method does not work with boxes that require the use of a remote like a Roku or AppleTV unless the box has a clear plastic front that lines up with the remote reader in the unit). If you live in an older home, you may have access to the floor joists. You have to be handy for this one, but you can create a trap door that lets you store items under the floor boards between the joists. This might be harder to achieve in newer homes since floorboards now come in 4′ x 8′ sheets of OSB, but it could be done. If you have a sleeper sofa that you don’t ever use for sleeping, you may be able to modify it into a storage sofa. You’ll need to remove the mattress and folding bedframe and replace it with a solid surface on hinges (like a toy box lid) and it might require reinforcing the structure of the sofa, but there’s a lot of room to be had under the sofa. If you hang plastic boxes under there, you can keep items from getting dusty too. Other storage devices similar to these include cubbies and storage headboards, ottomans with lift off lids and over the door storage. Some folks never use their dishwashers (especially singles) so you can just use it to store all of your clean dishes, freeing up cabinet space for something else. If you never bake, consider keeping those pots and pans in the oven. You can squeeze out some extra storage even in smaller homes, so when the clutter starts to build up, take a look at these ideas and put some to work for you.